How do I view my collection activity? 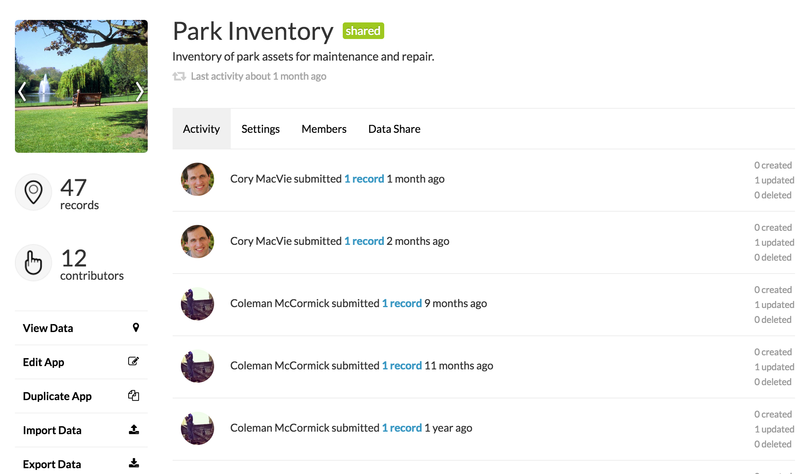 Using activity feeds in Fulcrum to monitor field collection and editing activity. The data that is collected within Fulcrum can be viewed on two different pages, the homepage and the app's dashboard page. We call this the activity feed. Each time a user syncs their device from the field or enters data through the web app you’ll see a new activity event with a quick summary of the changes made, what app was used, and a link to view that data. Along with capturing created records and edits to records, records that are deleted through the web app will also be displayed here. Fulcrum’s homepage has an overview activity feed on the right-hand side, intended to give you a birds-eye view of what’s going on moment to moment with your data collection activity. For a more granular view, you can go into the app dashboard view for a specific app and select the activity tab. This will display the activity data for that specific app. Activity feeds use changesets to generate the feed history events. Data added, edited, or removed through the API will not display in the activity feed unless changesets are being leverage when doing these actions. Changesets are not required when doing these actions through the API.